Earlier we've looked at starting off in Survival mode, plus simple combat. 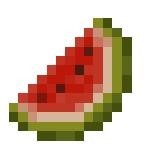 Now we look at a more refreshing aspect of Minecraft: Food! 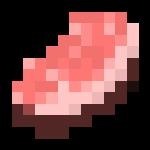 Ever since the hunger bar was added to Survival mode, food has tripled in its role. Having no food will slowly decrease your hunger bar and eventually eat into your own health. As covered in "Getting Started", it's one of the most important parts of Minecraft itself. Pork: Obtained from killing pigs. Raw restores 2 hunger bars; cooked restores 4 hunger bars. Beef: Obtained from killing cows. 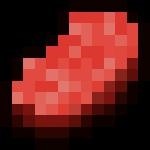 Raw heals 2 hunger bars; cooked (steak) heals 4 hunger bars. 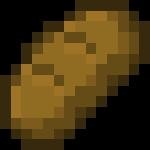 Bread: Obtained from harvesting wheat and "Crafting" it. Heals 3 bars. Cake: Made by sugar, wheat, milk (x3) and an egg. Heals 6 bars total (multiple uses). 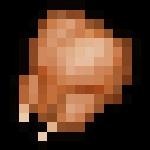 Chicken: Obtained by killing chicken. Raw heals 1 bar; cooked heals 3 bars. Fish: Obtained by fishing. Raw heals 1 bar; cooked heals 3 bars. 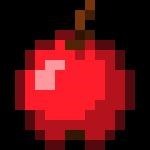 Apple/Golden Apple: Red heals 2 bars; golden heals 5 bars. 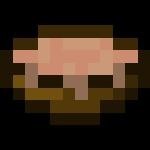 Mushroom Stew: Made with red and brown mushrooms and a wooden bowl. Heals 4 bars. 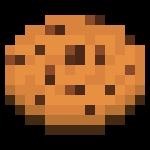 Cookie: Cocoa beans and wheat. Heals 1 bar. Watermelon: Planting watermelon seeds. Heals 1 hunger bar. 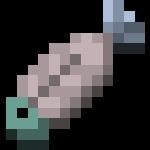 Farming is one of the easiest and most consistent sources of food in Minecraft. Wheat can only be planted on Farmland. 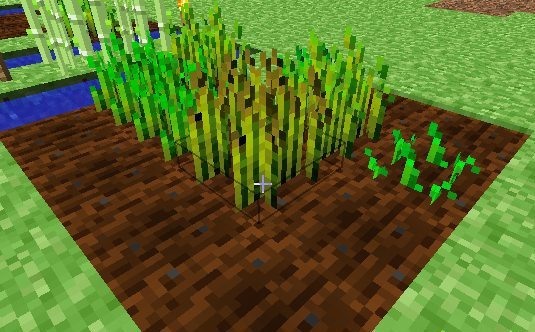 Although seeds planted on hydrated farmland will grow faster than those on non-hydrated blocks, non-hydrated farmland will still grow wheat eventually. Any source of water must be within 4 blocks for the wheat to grow. If there is at least 9 (light) level above them (not necessarily sunlight). If there is at least one block of space above the height of the fully grown crop (transparent blocks count as empty). To farm wheat, you first need seeds, which are obtained by destroying wild grass. A hoe is needed to till the soil. Though it says 1.7, I believe it works for 1.0 also. So explore different ways to farm by yourself! It provides the greatest opportunity for learning. Previously, Minecraft World's Ultimate Survival Guide, Part 1. Minecraft World's Ultimate Survival Guide, Part 2. These are truly amazing- keep it up!